My husband and I took a trip to Lake Tahoe this weekend. We had never been there before, and we both wanted to see this famous part of our beautiful state. Well, I had driven up there for a wedding several years ago, but I hadn’t been able to stay and explore during that trip. This trip was to celebrate my husband’s birthday, so I had booked us up a room at a ski lodge, just a few blocks from the lake, in South Lake Tahoe. After an arduous four hour drive, we arrived at our destination around 4 pm on Friday. We were pleased with our accommodations (Deerfield Lodge), a quaint ski lodge that was easy to find from the highway, but felt rustic and secluded. Since we were only a few blocks from the lake, we decided to walk there after unpacking the car. We were amused by the bits of snow along the side of the highway as we’d driven in. Now we saw bits of snow here and there around the town. It was fascinating to me that the temperature was far from freezing (high 50’s to low 60″s), yet because of the high altitude, the snow lingered. 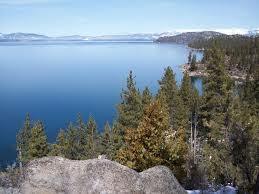 We strolled down to the lake…and we were amazed at the deep blue beauty of this hidden treasure. The snow-capped mountains huddled around the lake, protectively. The water was so still it was smooth as glass. A few like-minded tourists gathered here and there to enjoy the beauty of the “lake of the sky”. We both were glad for the timing of our journey. The busy summer tourist season was long past. The hustle and bustle of the ski season had not yet started. The only visitors there were folks like us, who just wanted to glimpse the natural beauty of Lake Tahoe, breathe in the mountain air, and relax. I was just thinking about suggesting a stroll down the shore when I noticed that I was suddenly feeling quite dizzy. The change in altitude had affected me during the drive up….I’d noticed my ears feeling pressure. I hadn’t thought though, that I would need time to adjust to life at this higher place. We were at 6500 feet above sea level…approximately…and my dizziness was my body’s way of telling me to relax and take some time to adjust. We found a bench to rest on, and after a while we made our way back to our room. My dizziness subsided soon, and we both were impressed with both the effects of a higher altitude on our bodies, and our bodies’ ability to adjust. On Saturday we slept in…took our time dressing and finding somewhere to feed ourselves, then decided to drive around the lake to get to know her better. It is 72 miles by road around Lake Tahoe. We could have driven it in a little over an hour. We took our time and stopped frequently, admiring the view from many different vantage points. One of our favorites was Zephyr Cove. It is a small inlet, calm, welcoming, and it looks like it is lots of fun in the summer. We decided we would like to go back when the days are warmer and see if our impressions of Zephyr Cove are right. We explored the Nevada side of the lake, which is largely undeveloped except for a some casinos just beyond the state line, in a town called “Stateline”. 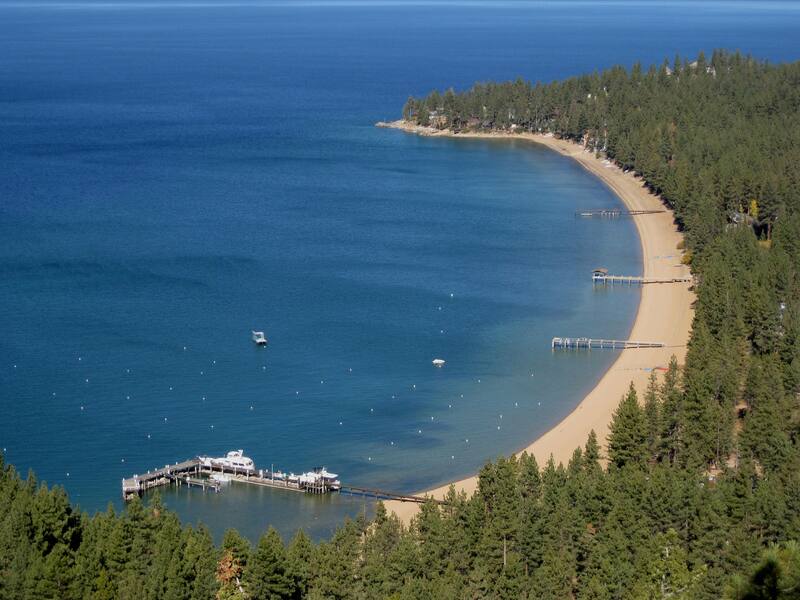 On the north shore, we drove through Incline Village, and decided that we were more suited to the more rustic South Lake Tahoe. On and on around we drove…noticing beautiful vistas, impressive and modest homes, and many tourist-minded businesses. My husband was tickled by the “bear crossing” signs posted along the way. We were both impressed by the hardiness of the locals compared to us non-snow shoveling tourists. We enjoyed the drive for the most part, although a stretch of highway that was a sheer drop from both sides of the road, with no barriers, gave us both a bit of a nervous twitch. 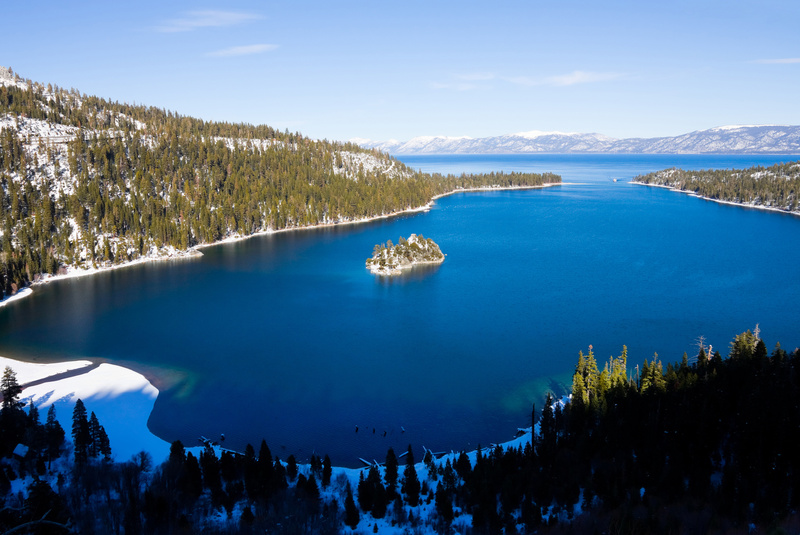 When our loop was nearly complete, we stopped to admire the famous Emerald Bay…a little (compared to the rest of the lake) herniated inlet with beautiful, emerald-green and gorgeous blue hues to the water. You can’t get down to emerald bay except by hiking down the side of a mountain. The locals joke that it is 2 miles down and 5 back up. But there is a place where you can park and look down the side of the mountain…and it is impressive.Soon we were back in tourist friendly South Lake Tahoe. We relaxed in our room while we reminisced about the beauty of the afternoon. 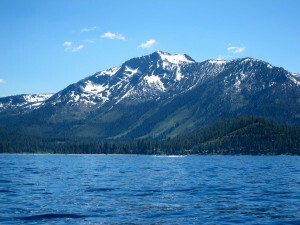 On Sunday, after we checked out of our room, we explored Emerald Bay again, this time by boat. It was even more beautiful than we could have imagined. We marveled at the clarity of the water….the beauty of the coast…and the peacefulness of it all. Having taken many boat rides on the Monterey Bay, we were deeply impressed by the stillness of the waters on this mountain lake. 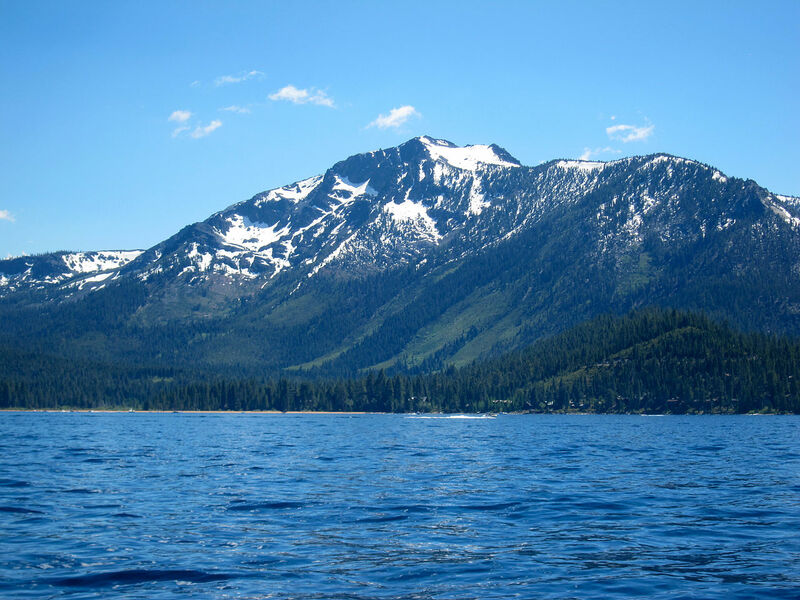 The Washoe people who originally visited Lake Tahoe used to come during the summer for fresh water, berries and nuts from the woods, and the coolness of the protected lake. They believed this area to be sacred. Having spent a quiet weekend there, I easily understood that belief. My husband and I were both refreshed by our time at the lake of the sky. A quiet, peaceful, reflective weekend admiring the natural beauty of Lake Tahoe left us both with a new respect for the healing nature of nature. Spend time in nature soon, if you are able. It is beyond measure one of the healthiest things you can do for yourself. Wishing you peaceful moments of natural beauty. 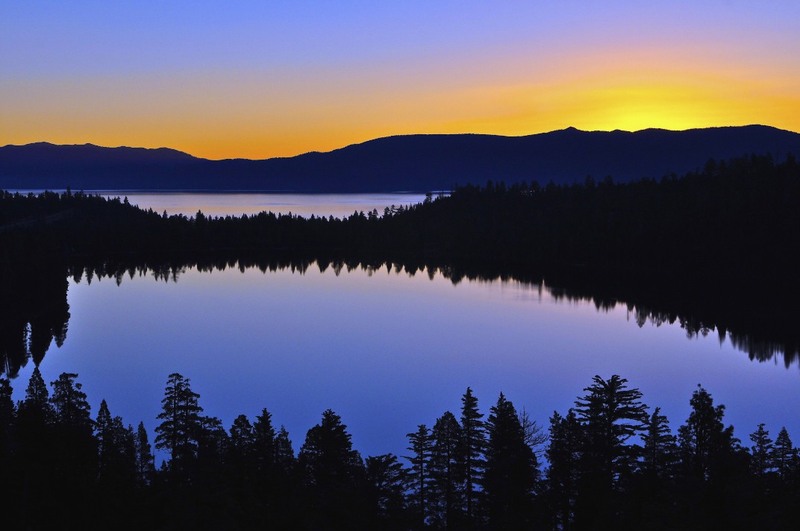 This entry was posted in Travel and tagged California, Emerald Bay State Park, Nevada, Respect, South Lake Tahoe, Zephyr Cove Nevada. Bookmark the permalink.